This is the place we put the great pictures that have piled up over the years. A few of the pictures are our own, but most of the pictures are fond memories directly passed along by our guests. We hope you enjoy looking at these fond memories ... like the two below selected from the family and friends pages. 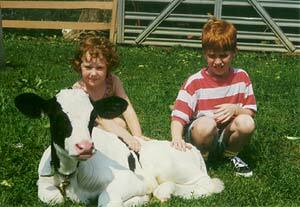 Left: Enjoying the warm spring sunshine, 1998. 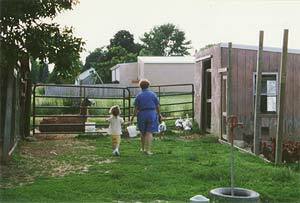 Right: Visitors from Virgina and Florida head toward the hen house to see if there are any eggs, June 2001.